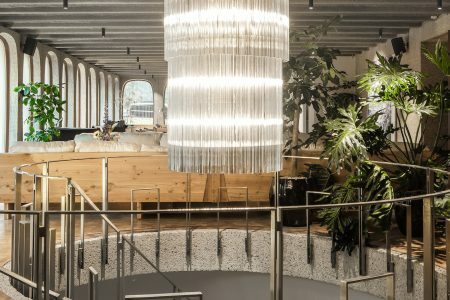 The trend forecaster and curator has opened a new design gallery in Paris. The first exhibition? 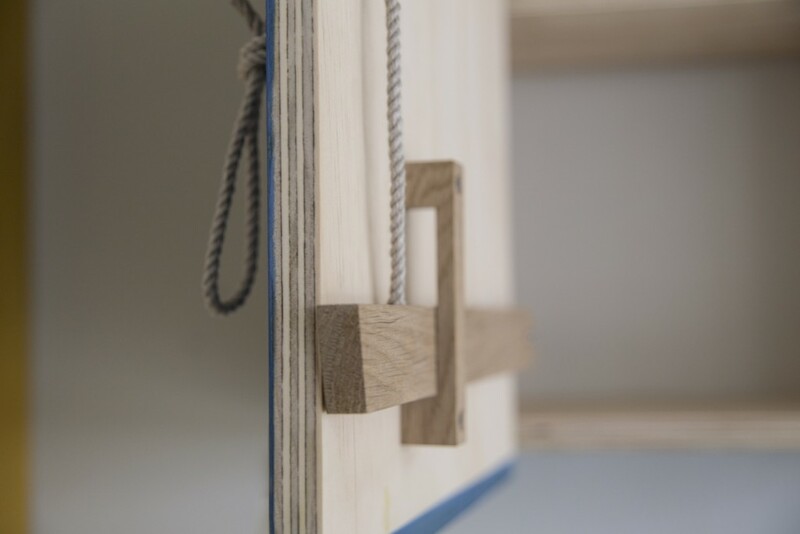 The Gift to be Simple, a nod to Shaker furniture. You’d expect that from Li Edelkoort. You’d also expect the unexpected. For the inaugural show at the Parisian spot, called The Gift to be Simple, she’s focusing on the values of the United Society of Believers in Christ’s Second Appearing —commonly known as the Shakers. Currently, there is only one Shaker community left in the world, but something tells her their love for building, sharing food and their sense of humour is more than relevant today. We talked about how the Shaker filter influenced her two picks —the young Dutch designer Friso Wiersma and Israeli textile artist Gali Cnaani— and how things have changed since she first had a salon in Paris. TLmag: You were interested in Shaker furniture back in the 90s. Why do you think its principles of simplicity and honesty are in need of highlighting again today? 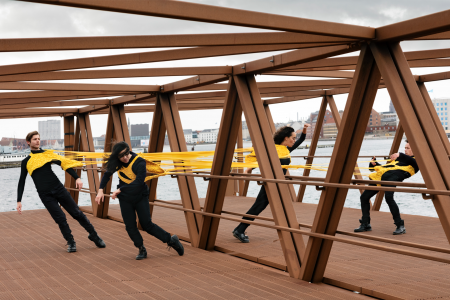 Li Edelkoort: We are in such a complex situation in the world, and problems are accumulating in such an overwhelming way, that at one point it becomes clear that we do need to change. We need to un-consume or de-consume and consume better, pay more attention and reach out, maybe, to the more spiritual experience in things. I believe that we are on our way to become more animistic, possibly. So, for me, the Shaker philosophy sounds incredibly contemporary. I’m preparing my major forecasting book, called Enlightenment —it’s all about spiritual movements. One of the movements I highlight is the Shakers, because of their incredible organisation. The fact that they didn’t procreate themselves in order to save all the lost children in the world sounds very contemporary to me. They way they built houses together. The way they had food and humour. The way they’ve been handling design at all levels —textiles, small objects, furniture. It comes back every two or three decades, and then we suddenly realise that, maybe, this is all we need. TLmag: With the first show at the gallery, you speak of “the strength to be archaic.” What is that about? LE: To be in touch with primal things. To trust my intuition and the intuition of my colleagues. To reach deeper into the unknown. Maybe sometimes showing things before you fully understand what is actually happening. TLmag: Is that perhaps why you’re showing the work of Friso Wiersma, who just graduated from the Design Academy Eindhoven? What attracted you to his work? LE: Certainly the colours! I was completely in awe of his colour card and the way he uses brighter colours on more unusual pieces, so they stand out like exclamation marks —and the more regular shapes are deeper, darker, more neutral. So the way it holds itself together is quite excepcional. There’s also a severe honesty in this work, which spoke to me. I like the fact that he’s going to work with his brother and that they will develop pieces to measure. They’re obviously aiming at a career of furniture making, which I find very relevant today. TLmag: Why is furniture making so important nowadays? LE: Because I think we are at the end of a period where we are still deconstructing, but there’s the growing idea that we need to reconstruct. That’s what challenging in this work: it’s really about construction. If you could empty your house, what would you do? Maybe you’d create another dynamic. That’s what you see in his pieces: they work amazingly well together. But I would imagine just having the standing cupboard in yellow alone. It’s very exciting. TLmag: Speaking of reconstruction, it’s interesting to see how Gali Cnaani doesn’t demonise the clothes manufacturing industry. The fact that your work is so connected to textiles makes me think it’s quite a statement to open your gallery with her pieces. LE: I met her this summer, because I did a lecture in Tel Aviv about the textile course I’m opening in Parsons in September. She gave me her book and I was blown away. She takes bits and pieces of cuffs and collars and epaulettes and bits of jeans, so you still recognise the origin —there is a button or a label— and then she’s undoing the textiles and remaking it with another fibre or yarn. Sometimes she even weaves two sleeves into each other as one. It made me think of the work of the Shakers, of the love presents they give to each other —drawings or quilts and food and paintings and poetry. This, for me, is visual poetry. It’s like textile miniatures, in a way. I was humbled by the simplicity, and yet the scale and vision and the beauty of the everyday. She makes you suddenly look at a shirt in a completely different way. We are so overwhelmed with fake news about style that this truthfulness becomes a major direction. TLmag: Is there a thread to the vintage objects selected by François Epin for the first show? LE: Yes; the idea behind us working together in the future is to set a sort of direction. I guess that I will be responsible most of the time for the direction, because that’s my work —so we could argue that it’s a 3D forecast. Then the idea is to see how we can fit the same message into his world, in vintage and high-end design. 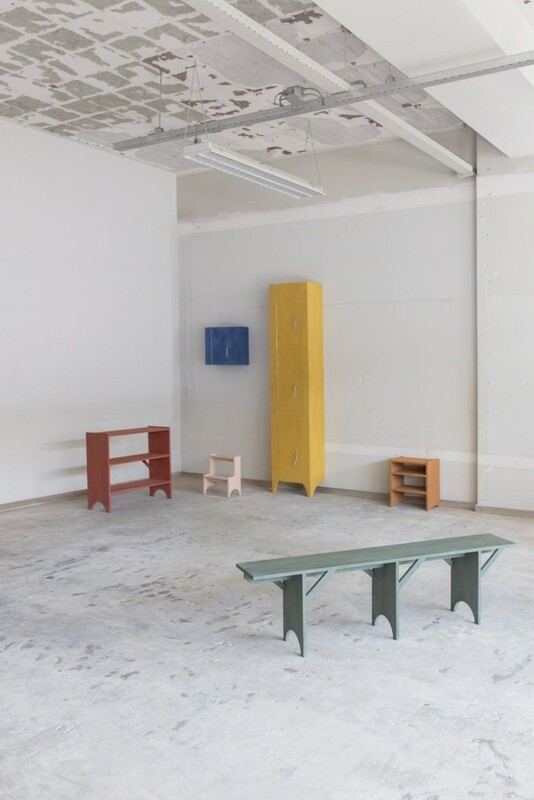 He made a very interesting selection of wooden objects, mostly Scandinavian —in the 50s and 60s it was huge, and it was inspired by Shakers, so that’s how it all comes together. TLmag: You’ve done art collecting before. Why did you go into design collecting now? LE: When I did my art salon in the 80s I had a chic apartment in the rue Saint-Honoré, two doors away from Colette —but at the time there was no Colette, no shops, it was a very barren area. So I started to do this because I thought, “Paris is so boring… Should I go, or should I do something?” So it became this hugely popular thing, and for three years I did a show every month. It was very hectic. We would have thousands of people coming to the openings. I had to have security guards. It was quite crazy. Ever since, I’ve had to leave that apartment and I’ve been in some other places. Now I’m on the boulevard Saint-Jacques, in a place with few walls and a lot of space. There’s also, of course, my passage as a chairwoman at the Design Academy Eindhoven. 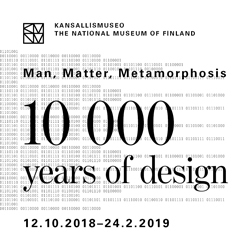 It has been crucial in my life, to further develop design, and to understand that design is one of the major disciplines of this century —so much so that we’re seeing a lot of design in art. The borders of things are completely fluid, so it’s very possible that we will also be showing art sometimes… but it’s not an art gallery. 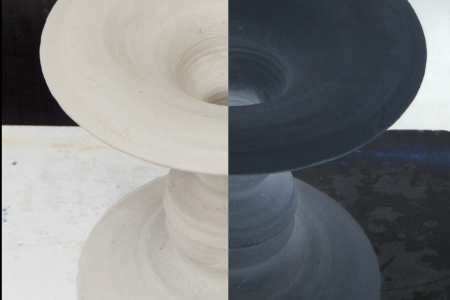 Friso Wiersma's By Hands (2017). Image by Anastasija Mass. 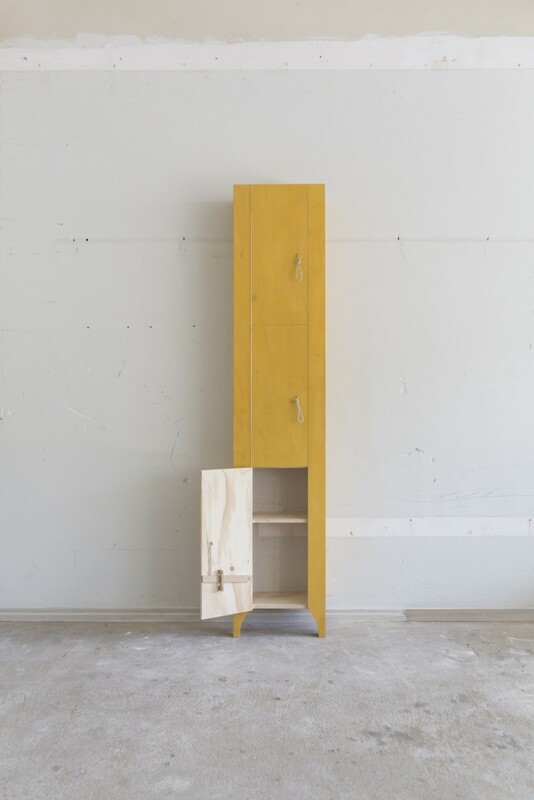 Friso Wiersma's By Hands Cupboard (2017). Image by Anastasija Mass. A detail of Friso Wiersma's By Hands (2017). Image by Anastasija Mass. 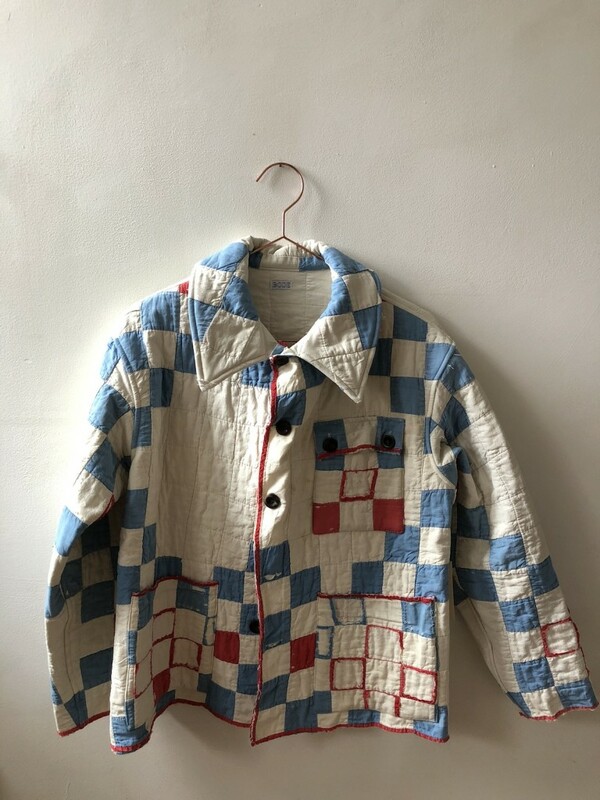 Bode New York honours the American craft tradition of quilting, hand-sewing one-of-a-kind jackets of pure and graphic beauty, in soothing textile remnants that are faded by time. 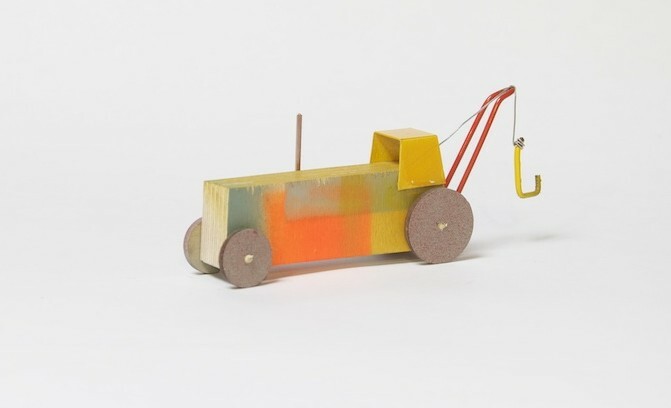 Floris Hovers has created CarTools for Magis, a set of painted beech shapes that can be rearranged into playful automotive models. Hovers searches for simplicity through colour and abstracted form. 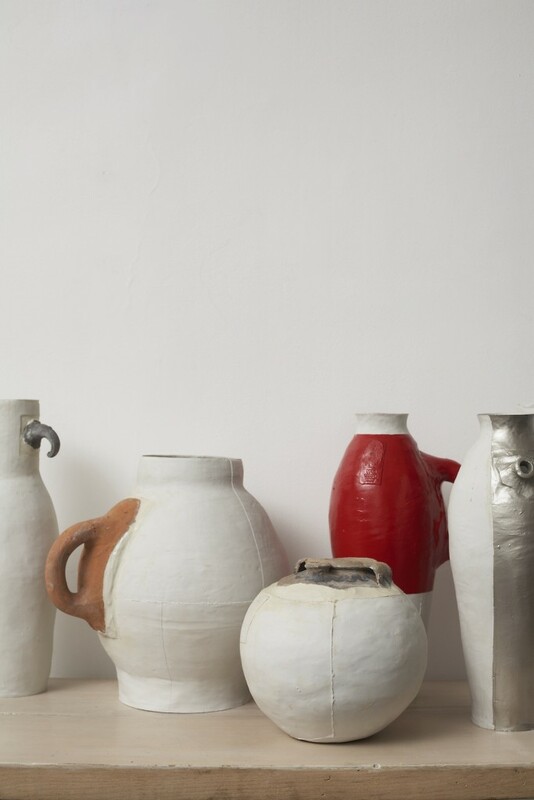 7 Pots, 3 Centuries, 2 Materials (1997) by Hella Jongerius, The Edelkoort Design Collection. Image by Thomas Straub. 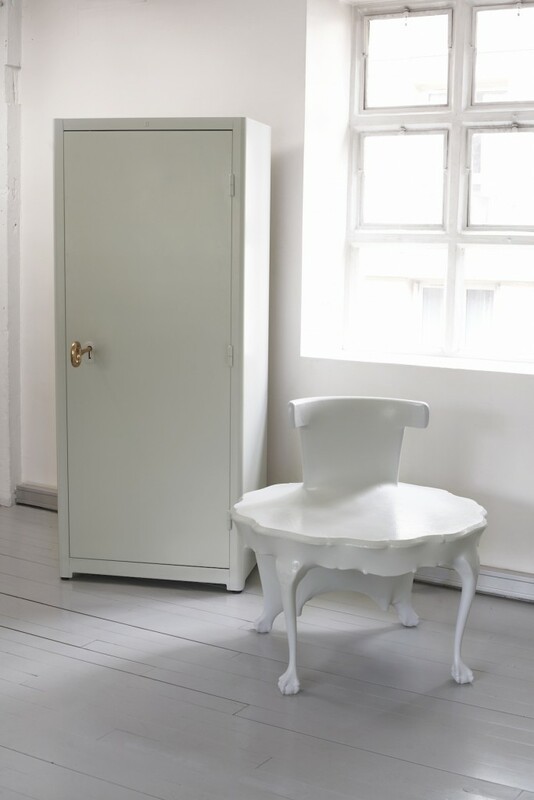 Job Cabinet (2011) by Studio Job and Kokon Round Table Chair (1999) by Jurgen Bey, The Edelkoort Design Collection. Image by Thomas Straub. 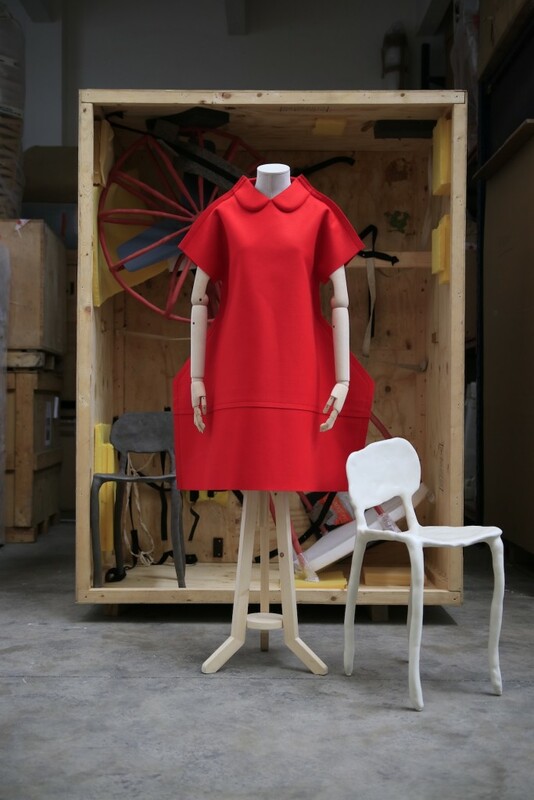 Dress AW 2012/2013 by Comme des Garçons and Clay Chair (2009) by Maarten Baas, from The Edelkoort Design Collection. Image by Daniel Costa.